Have you thought about what the immediate aftermath of a serious crash might be? Would you be conscious? Able to speak? Able to tell first responders what medications you’re taking, any special medical considerations and who to contact? These considerations and the importance of administering the most effective care as quickly as possible to crash victims led to the creation of the Yellow Dot Program. It is designed to communicate critical information to first responders when crash victims might not be able to speak for themselves. Utah started its Yellow Dot Program in January 2012. Yellow Dot can be used in conjunction with the Vial of Life program. 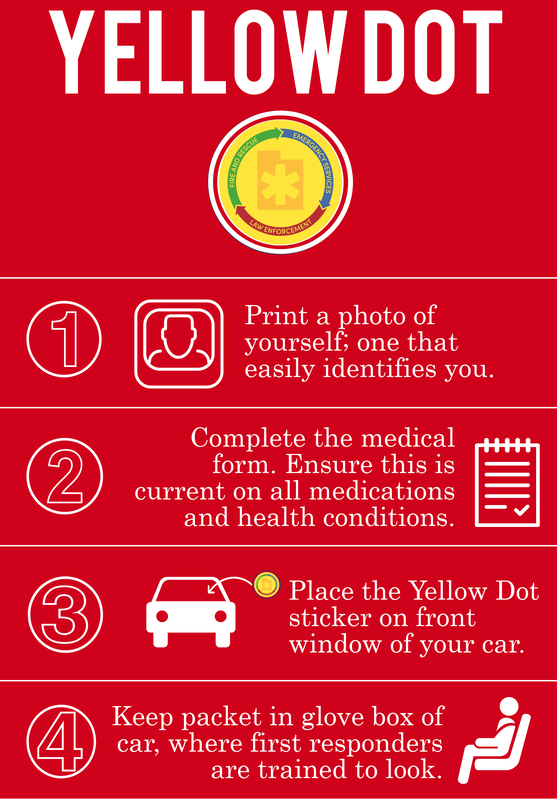 There are four simple steps to making the Yellow Dot program work for you. You’ll need three items: a picture, a Yellow Dot Information Formand a Yellow Dot sticker. Complete one form per person for each person who regularly rides in each vehicle you own.